Woke up before dawn this morning - very unusual for moi - and this is what greeted me at window in the lounge. The fountain had been frozen for a few days, but it was full of snow. The whole landscape was white. I was very glad to be indoors. I was also glad to have the cuppa that Grams brought me a little later. Grams is hoping to see the Dr. Who Christmas special here in real time, instead of having to wait for it on BBC America in February or something, for heaven's sake! These last few days of David Tennant (nee, McDonald) as the Dr. are all the buzz here. He will be missed, I suppose. I'm still waiting for Primeval to come back on, that's my favorite show. Even though Doug Henshaw has left , along with a few others, I still love all the creatures. When the sun came up, I ventured outside again and took a few more pics. On the right, that's one very frozen ornamental cabbage. I do like the lady in the ivy. She does look a little cold though. Right now the wind is howling - I suspect it's gale force. But, we're tucked up warm inside Gwel Y Gorwel. I do hope Bronwyn and the child like their presents. This is the sky about 20 minutes ago. At the mo' it's a tad darker. Of course, seeing her off involved the usual cockup. I elected to sit on the trunk while Big Guy helped Grams with her suitcase. He got the case on and stowed, but then the doors closed and he started off with train. Imagine the expression on my mug. What was I to do? I didn’t have the car keys and even if I did, I can’t drive. Well, I can drive, but I can’t do the pedals. So, I sat and waited. And waited. And waited. A half hour later, a train came from the south and off stepped Big Guy. “Don’t ask,” he said. Needless to say, I didn’t. So, Grams is in New York with Henri and his mama. Yesterday, Grams and Henri’s mama went into the city. As far as I can tell, they stopped for lunch and on her way to the Ladies; Grams missed a step and went face down into a very non-forgiving floor. Evidently, her front tooth went through her upper lip and she broke her nose again, so she’s got another shiner and a fat lip. Oh, did I mention that it's blazing hot too? Of course, she got up, dusted herself off, and went on with her shopping. When it comes to shopping the woman’s indomitable. She did manage to send me some pics that she took before the fall. I especially like one from the old New York Sun building (no the temperature gauge isn't working). Of course, I always like the subway art. Isn’t the mythic sewer croc great? The subway scofflaw is pretty cool too. Please give what you can to Doctors Without Borders and support Kiva. I have found a way to distract the Grams. I reminded her that Guy Fawkes Day is upon us. Back in 1605 a group of Catholic men decided that they wanted England to proclaim its fealty to Mother church and the Pope. So, they decided to blow up Parliament and King James the 1st along with it. So, these fellows rented a house next door to Parliament and dug a tunnel (sounds like that Woody Allen movie, right?). 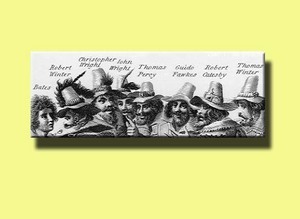 Unfortunately for Guy Fawkes, he drew the short straw: he was left to light the fuse on the dynamite. To add to his misfortune, someone in on the plot wrote a little billet doux to a certain Lord Monteagle (great name, huh?) warning him to stay away from Parliament on the 5th of November. Guy Fawkes, Guy Fawkes, 'twas his intent to blow up the King and the Parliament.! Three score barrels of powder below, Poor old England to overthrow:! By God's providence he was catch'd With a dark lantern and burning match.! Holloa boys, holloa boys, make the bells ring. Holloa boys, holloa boys, God save the King! Hip hip hoorah! et sic per gradus ad mia tenditur (which basically means, gradually increase the torture until he squeals like the rat that he is). 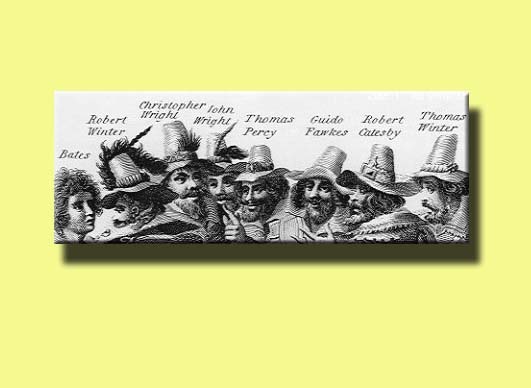 So, the tradition of Guy Fawkes Night (or Bonfire Night) was born. Old Guy is burned in effigy (though originally it was the Pope) and people cook jacket potatoes and other goodies in the fire. In addition to the baked potato, parkin (combining oatmeal and treacle), hot soup, cocoa, gingerbread men, treacle toffee and toffee apples are also consumed. And there are fireworks, too! Grams loves this drawing of the conspirators: Guy is called Guido, which is of course my given name. There are grand Union railway stations throughout the U.S. Most had already been built by the time the city of Los Angeles decided to build one of its own. Most other grand stations were modelled after the Neo-classical or Beaux Arts styles. As an example, Pennsylvania Station in New York was designed after an ancient Roman bath. Union Station in LA opened in 1939 and it’s still a masterpiece of civic indulgence. When a city built a “Union” station it was because they wanted a convenient place where all the rail lines could converge. So, if you have a Union Station in your city, it isn’t for the Union of the states, it’s for the union of commerce. 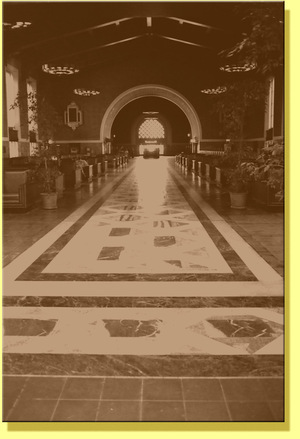 The Los Angeles Union Station is built in a Moorish-interpreted-through-Art Deco style. Admittedly it’s no Grand Central Station; but it holds its own. Also, the formerly white tiled tunnel that leads to the train platforms has been retiled into something considered more “soothing” I suppose. More’s the pity. Grams did a photo essay of the station back in the ‘80s and these are just 2 photos from that essay. Now, here’s a secret: When you get to the entrance of the station, before you go in, turn to the right. Stroll over to the place where the building juts out. The windows are partially covered so you’ll have to get on tippy-toes to see in, but it’s worth it. You see, this was the Fred Harvey restaurant. All the stations that the Atchison, Topeka and the Santa Fe railway served had Fred Harvey restaurants. It looks as if the last shift just left (or at least it did when we saw it last). Someone should re-open it. After you check that out, turn to the left and walk through the garden patio. There aren’t usually crowds there. Then, you can go back to the front and walk through the front doors of the station and be stunned. It looks pretty much the same as the day it opened in 1939. There’re marble floors and Spanish style tiles on the wall, soaring ceilings with magnificent chandeliers. You’ll feel as if you’ve stepped back in time, to a place when the whistle of a train could still get you excited and waving at the train as it went by was de rigour for everyone. What’s the picture? 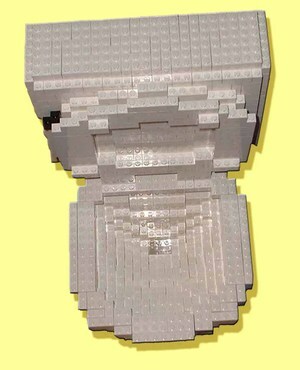 Look again, yes it’s a toilet made out of Legos. * Why a loo? Of course, you know it must be an embarrassing story about our Grams. Actually it’s two stories about a lesson not learned. When the Grams was young she and her friend, Kathy Pierce, were at a restaurant called the Wagon Wheel. Now, I find that funny in itself: the Wagon Wheel, but I digress. They went to the ladies. There were two conveniences in the room. Kathy went into the first one; Grams went over to the second one. 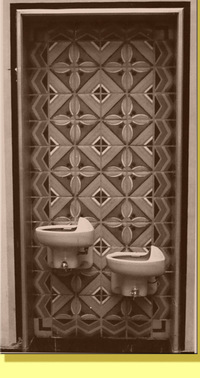 The door to the loo was one of those accordion ones – it wasn’t quite closed all the way. Our dear Grams, figuring that this meant that the facility was free, pulled the door open. Yes, there was an occupant, knickers around ankles, horrified. Screams and apologies, well you can imagine. Unfortunately, when Grams and Kathy left the ladies, they burst into gales of laughter. The lesson was not learned: knock first before entering. It would take 45 years, but this hubris would eventually catch up with the Grams. At a later stage in life it would shame her no end. Okay, lap/dissolve and it’s Wales in 2004. Grams, Big Guy, Marian, Emlyn and I were on a day trip. We stopped in a market town and, after dipping in to each and every stall, Marian and Grams announced that it was time to eat. I had to agree. Sitting down sounded good to all of us. We ordered our meals at the counter and then Grams said, “I think I’ll spend a penny.” Off to the loo she went. Now, I have only her word for the next part, because all we heard were the screams. As Grams tells it: she approached the loo. She saw that there was a choice of two, opposite each other. One had an outline of a man, the other a woman. The men’s was closed, but the sliding door on the women’s was not hooked. So, our dear Grams, figuring that this meant that the facility was free slides it open, with gusto. Well, of course there was a woman there, knickers around ankles. This time it was an elderly lady, good friend of the owner. She was scared out of her wits. Grams was horrified. She was afraid that she had killed the woman. Much fuss was made. Grams was very apologetic. Emlyn, Big Guy, and I were laughing into our napkins. Marian was as horrified as Grams. If Grams had learned her lesson at the Wagon Wheel, all of this Sturm und Drang could have been avoided. However, our Grams is not one to learn her lesson the first time. Or the second. Or the third. Will she knock first now? I wonder. But we love her anyway. Besides, she’s always good for a laugh. *Grams says that the Lego loo must have been made by males: the seat is up. I have this dream of a trip. I have wanted to see the Aurora Borealis (the Northern Lights) for a long time. I’ve bookmarked sites that have live updates on solar storms. 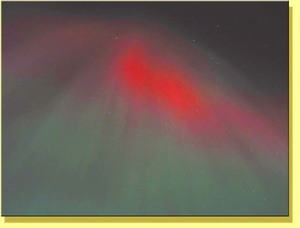 Solar storms are where the Aurora Borealis starts. These lights look so magical and I’ve never seen them in person. Most folks go to Alaska to see the Aurora, but I don’t want to see them from there. Nothing against Alaska, I just have a place I prefer. Many years ago (1983), I saw a movie called, “Local Hero.” I was enchanted by the story and the characters. But, most of all, I loved the locations. It was shot, mostly, in Scotland. I had never realized that you could see the Aurora from Scotland. Once I knew this, I have wanted to go there. “Local Hero” tells the story of Mac McIntyre. Mac works for a big oil company in Houston. His boss sends him to this little town in Scotland in order to buy the entire town so that the oil company can built a huge refinery there. Mac thinks that he’s going to face a hostile crowd, but the townfolk are eager to sell up and get out. The scheme all goes pear-shaped, but they all learn valuable lessons in life. It’s a quiet little film. It’s one of my faves. The town of Pennan was the town in the film. It lies on the North East coast of Scotland. Since the hero of the story sees the Aurora from there the first time, that’s the town I want to go to. There’s only one sticking point: talking Big Guy into this particular adventure. Grams is all for it, but Big Guy isn’t as keen. Since I first brought it up though, our friend Emlyn has offered to go along (and drive). Also, since Marian is now retired, she’ll have the time to come too. I think that Big Guy is starting to warm to the idea now. For now, I’m putting together the trip for next spring to Vienna and Florence. So, Scotland is far in the future. I was a little concerned about the Grams. She’s been in an absolute funk in recent days. I was going to try to cheer her up, but a phone call from Wales solved the problem. The call was from Emlyn and Marian. “It’s amazing. I was just thinking of calling you!” said Grams. After Emlyn regaled Big Guy with his tales of finding spanners at the Costco in Liverpool, Marian got on the phone and she and Grams talked about the usual stuff. I wandered out of the room. Marian had taken her elderly Auntie to Paris. Auntie was visiting from Australia and had wanted to see Paris. Being from Australia, Auntie thought that Paris was closer than it actually is to Wales. 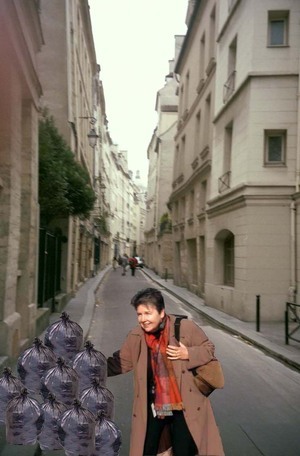 True, there are ‘peeps’ who do fly over to Paris for the day to shop, but our Marian is not one of them. Auntie held up pretty well to the walking and touring, but one day she became quite tired in mid-afternoon and retired to their room for a wee lie-down. Marian decided to go for a walk. She went to the park nearby and sat on a bench for a while (one of my favourite pastimes whilst in Paris). Then she went to a market and bought some cheese to take home. Walking along the street, she decided to scope out the restaurants near the hotel for their evening meal. She found a couple of Italian and a French restaurant. They all looked quite good and Marian was pleased. As she turned from the French restaurant to go back to the hotel, she saw two women across the street. These women were putting what looked like brand new women’s clothing into ‘Hefty’ Bags (bin liners). They weren’t tossing in the clothing. They were neatly folding and putting it in with great care. “That’s odd,” thought Marian. The women calmly filled the bags and then walked away. Marian stood there for a mo’, gobsmacked. Why would women throw away what looked like perfectly good new designer clothing? She looked left and then right, no one was paying any attention to this treasure trove. Maybe she was wrong, maybe it was just old rags. Well, she would never know is she didn’t go look. Yes, our Marian walked across the narrow street and quickly dipped into the bags. She didn’t want to be seen as a ‘dumpster diver,’ so she casually put her hand in and felt something that seemed like a beaded piece of fabric. She thought, “Ooh, that will make a lovely evening bag.” She grabbed the fabric and put it in her cheese bag. Then, as nonchalantly as she could she strolled at a brisk pace down the street. She didn’t dare look until she got back to the hotel room. By then, Auntie was awake and Marian told her the amazing story of the bags of clothing. When Marian pulled her finds out of the market bag, they turned out to be two beaded silk designer tops. They looked new, hardly worn. She was thrilled. That evening, Marian and Auntie went to eat at the French restaurant across from the treasure-filled bin liners. As they sat at their window table, they could see the bags of clothes across the street. By now many people had been through the bags. The clothes had been neatly folded before, but were in disarray now. Auntie had been sceptical before, but now she believed in the magical bags of clothes. A woman with a pram came by and filled up. Then, another woman came up with a trolley and started to load up. After dinner, Marian and her Auntie very casually strolled over to the bags. There were still copious amount of clothing. They dipped in and pulled out gorgeous things. This time Marian didn’t have her shopping bag with her, so they couldn’t take too much. C’est la vie. Grams laughed, “Marian, somewhere there’s a CCTV with you on it doing a bit of ‘dumpster diving.’ Either that or it was “Candid Camera. I love it! You know, if I had been there, I would have picked up a couple a bin liners just walked off with them, just like St. Nick.” She laughed and laughed. She hasn’t laughed that hard for ages. Yes, the photo is ‘photoshopped.’ That’s Grams not our Marian – I couldn’t find a picture of Marian doing anything as silly looking as that. With Grams it’s easy, she’s always doing something silly. We went rambling along our central coast neighbourhood yesterday. Henri was the navigator. We went along Highway 1 and ended up in Guadalupe. The town of Guadalupe is eye-blink small (as in: don’t blink your eyes ‘cause you’ll miss it). It’s an agricultural town. Most of the time it’s shrouded in fog, and yesterday was no different. There is a great old eatery in town called the Far Western Tavern. They specialize in the foods of the town’s founders: Beef and Italian. Lots of Italian names on the headstones in the local cemetery. 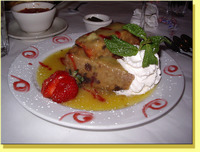 That was a surprise, before we went there the first time, we figured on a Mexican/Spanish heritage. The Far Western folks also, thank goodness, make a mean bread pudding. We all shared that, because we were so full from lunch. I stuck to veggie Italian, they had beef. After our huge meal, we went out to the dunes. The dunes are the main attraction in Guadalupe. As you head west out of town, the dunes loom up before you like silent giants. They getter bigger and bigger the closer you get to the shoreline. This time of year you’re restricted to the beach. The dunes are off-limits because the snowy plover is nesting. Come March, the ropes come down and people scramble all over the dunes. Many of them come to find the secret of the dunes. The dunes’ secret is that under them lies the remnants of a film set. Back in the early part of the 20th century Cecil B. DeMille made a silent film, The Ten Commandments, there. When the film was done, the sets were abandoned. The dunes reclaimed them. But every once in a while, the shifting sands reveal their secret. It’s amazing that these flimsy sets have lasted so long, but of course they were huge. As Henri was building sand castles and Big Guy was enjoying his cigar, Grams wandered over the picnic area in the photo. 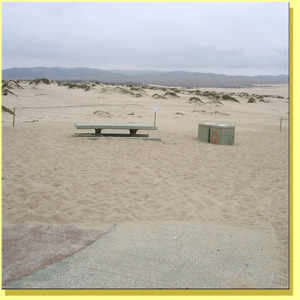 Earlier this year the state put in cement picnic tables, walkways and bins, but the dunes have begun to claim them. The parks folks are going to bring in a backhoe to re-claim their equipment, but in the meantime the tables sink into their sandy beds. I came over to see what Grams was up to. 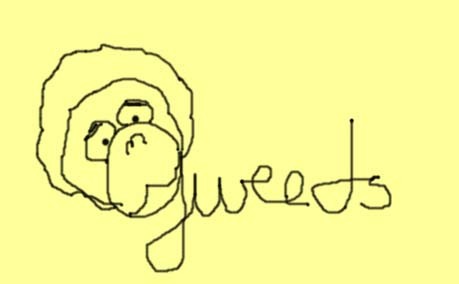 “it’s reminds me of 'The Woman in the Dunes,' Gweeds.” “The Woman in the Dunes,” is a novel by Japanese author, Kobe Abe. It was made into a film in 1964. It’s the story of an amateur entomologist who falls into a Kafka-esque existence when he misses the last bus home as he’s collecting insects for his collection. He takes shelter with a woman who lives in a home in the dunes. Her entire existence consists of keeping the sand from inundating her home and suffocating her. Life is a long eventful romp but, like the dunes, it’s moving toward its inevitable conclusion. Our “back hoe” will someday serve a different purpose. The fate of this picnic area, just 6 months after it was installed, left us in a thoughtful mood all the way home. 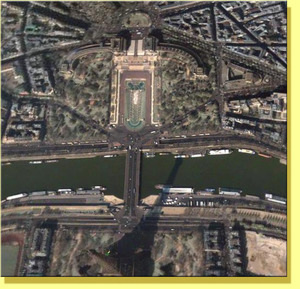 I got to thinking about the arc of the Trocadero and it reminded me of another arc and how different it is from the Trocadero. 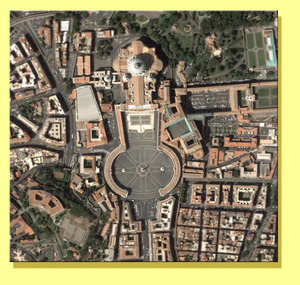 The Piazza S. Pietro (St. Peter’s Square) in Rome, despite what it’s called in English, is also a circle. But there’s a very different feeling about St. Peter’s compared to the Trocadero. St. Peter’s draws you in and seems to enfold you in its arcs. Also,it’s set in a densely populated area completely lacking in greenery. It pulls you toward the basilica. There is a very different purpose to this arc from the Trocadero. The Troc is paying homage to the Eiffel Tower. St. Peter’s is drawing you into the church universal. Yet, because St. Peter’s arc is not a building as the Troc is, there is a surprising lightness about the circle when you’re in it. You can walk in and out of the ‘square’ at will. It’s all in the angle. Again, looking at the extravagance of the open space at the Troc and the enclosure around St. Peter’s, I’m gobsmacked at the greenery around the Troc. But, that’s also very Parisian. Think about the Tuilleries, the Champs de Mars, the Bois de Boulogne, and all the little pocket parks all over the city of light. The Parisians may live cheek to jowl, but their public places are open and beautiful. There are fountains and statues and plenty of benches to sit and enjoy the view. And there’s nothing better than to sit on a park bench in Paris and just enjoy being there.